I love how this home blends texture and style so effortlessly. 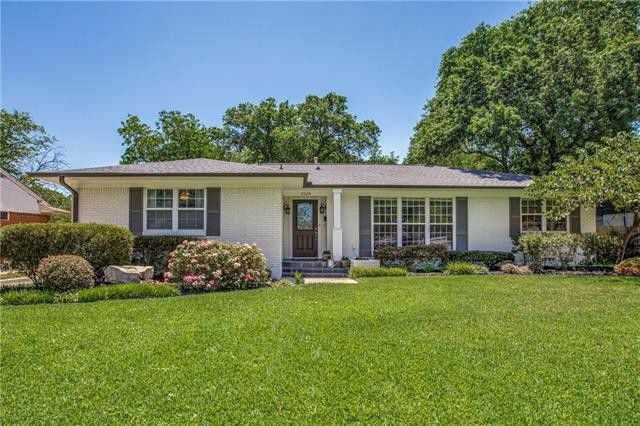 From the front of this home in Sparkman Club Estates, you would think that it’s just your average 1960s traditional ranch. A rambler with perhaps a few updates, but nothing dramatic, nothing special. Of course, that’s where you’d be absolutely wrong! Surprises are behind every door — even the back door! 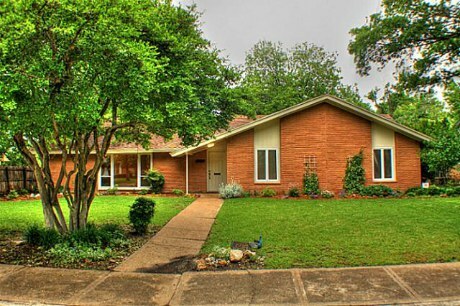 — of this 1959 traditional. Jump to see them all! 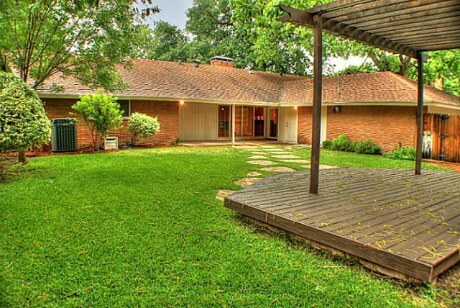 This is one of those homes that will appeal to just about any palate. 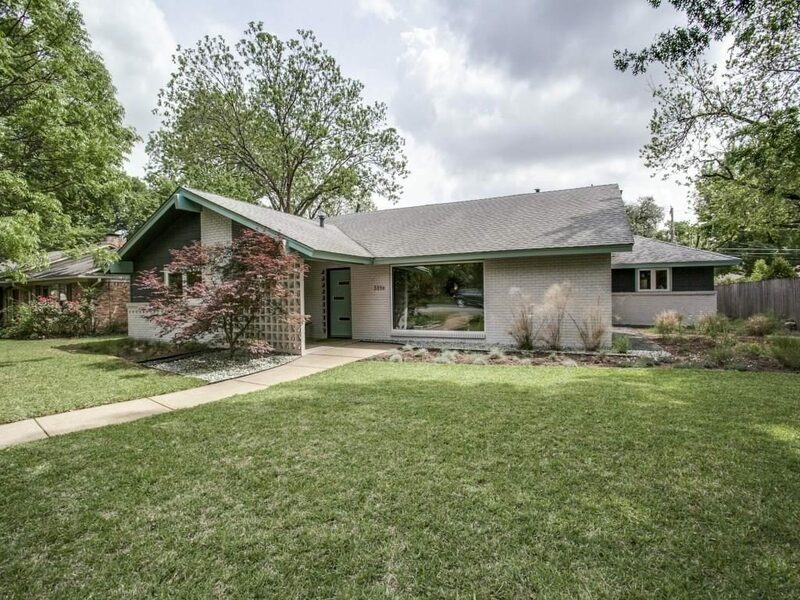 Listed by Keller Williams Realty agent Todd Smith, 3215 Darbyshire offers the 1960s ranch layout without all of the weird paneling and outdated fixtures, and for an affordable price at $280,000. 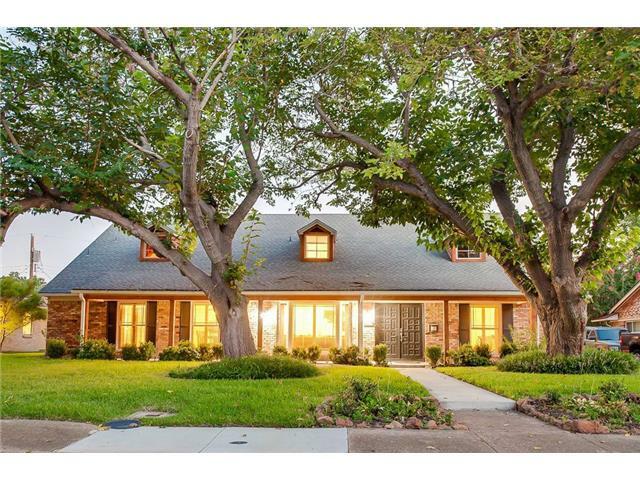 The sellers have really put a lot into this Sparkman Club Estates house, and some of the upgrades are to die for. 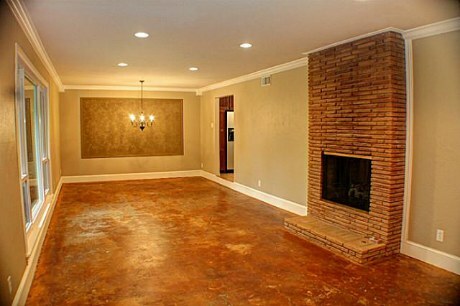 I love the polished concrete floors in the living and dining areas. It really highlights the brick fireplace, which is a two-sided gas fireplace. Love those! 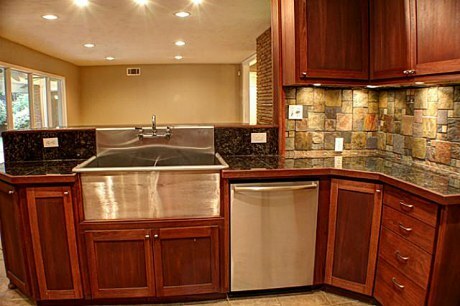 The kitchen has granite tile counters with tumbled stone backsplashes. There’s a Viking range and a convection oven, too, all of which are stainless steel. The real scene-stealer in the kitchen, though, is the commercial-grade stainless steel apron sink. I can’t even remember the last time I saw one of these outside a restaurant kitchen! The master bedrooms is sized just like Baby Bear’s porridge — just right at 14 x 17. 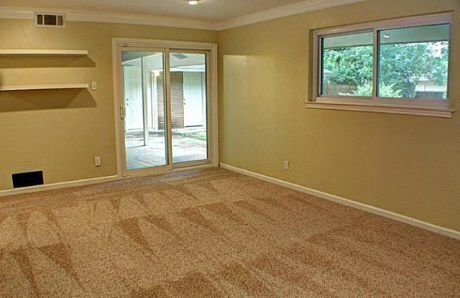 It opens to the back porch, too. That’s a great feature for folks who like to take in a breath of fresh air first thing in the morning. 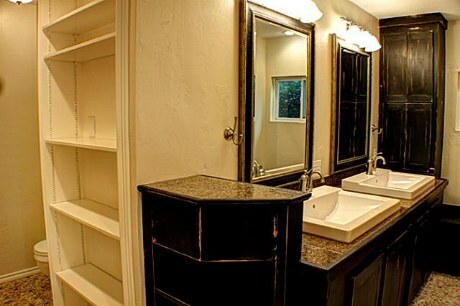 The master bath has been updated, too, with distressed black cabinetry, granite, and cabinet-top vessel sinks. 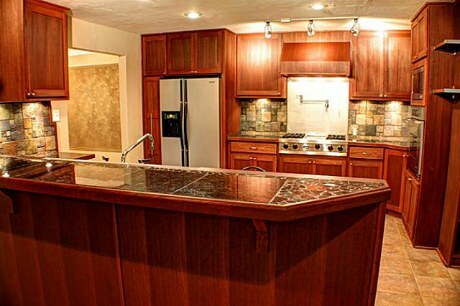 I don’t know if I like the cabinetry, but it’s not my house, either. It seems a little dark, but I’m pretty sure that a coat of paint could fix it. The backyard, it’s just splendid! I love the stone path and the deck with pergola. That’s a fantastic feature. Put a spa right there and I may never leave!